The holiday shopping season is here. What's hot? Toys from the 1980s. That's right. He-Man, Strawberry Shortcake, Care Bears and Transformers are a few of the brands being re-released. 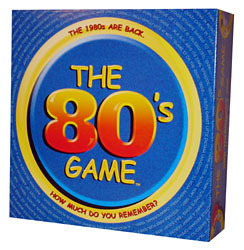 There's even "The 80s Game," a new trivia board game for adults from Intellinitiative. So why are store shelves packed with 80s products? Toy industry experts say that kids -- and adults -- just can't get enough of these "retro toys." "Many popular product lines from the 1980s have been reintroduced or enhanced for the 2003 holiday season and we expect them to be big sellers," says Shannon Eis, spokesperson for the Toy Industry Association. "It seems as if parents who once played with these items are hoping that their children will take as much enjoyment from them as they did," Eis says. And that's just fine with toy retailers, who eagerly anticipate the busy holiday shopping season. "Retro toys are selling briskly right now and we expect that the high demand for these products will continue through the holiday season," says David Novitsky, vice president of merchandising for KBtoys.com. Re-releasing best-selling toys is not unusual in the toy industry. For example, new versions of Barbie and G.I. Joe pop up every year. However, this year's crop of re-released 80's toys is turning some heads. That's because the new versions are now sold with "modern day" accessories. For example, Strawberry Shortcake now comes with a DVD. He-Man talks, thanks to a tiny microchip. And you can buy Pac-Man for Xbox. All of which must have some parents doing a double-take when they walk down toy store aisles. To feel young again themselves, adults can catch retro fever with The 80's Game. A quick glance at the game's trivia cards reveals topics such as The Cosby Show, Fletch, Madonna, and The Breakfast Club. "People who grew up in the 1980s are now getting married and having kids, and they want to remember their younger days," says Anne Siegert, vice president of the company that makes The 80s Game. Siegert says that the game's music trivia questions are especially popular with players. One question asks for the opening lyrics to the 80's song "Come On Eileen." But do players actually remember songs like this? They do, according to former MTV vee-jay Nina Blackwood, who hosts the syndicated radio show "Absolutely80s." Blackwood says she gets hundreds of requests for the song by Dexy's Midnight Runners. "People don't seem to get enough of many of the big hit artists I first played on MTV," says Blackwood, who many will remember as one of MTV's original vee-jays in 1981. And those 80s memories could explain why many parents are poised to purchase 80s toys for their children this year.